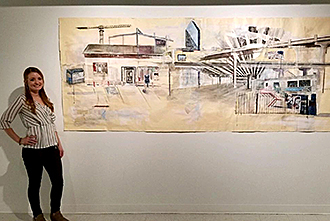 Artist Alexia Mentzel with one of her works on display at the Foyer Gallery at Paris Junior College. The opening reception is Tuesday, Feb. 12, from 4:30 p.m. to 6:30 p.m. The public is invited to a free opening reception for guest artist Alexia Mentzel on Tuesday, Feb. 12, 2019 at Paris Junior College’s Foyer Gallery from 4:30 p.m. to 6:30 p.m.
Mentzel is an emerging artist in the Dallas art scene and she was awarded the 2018 Conception Global Art Collective Award for Excellence. She is an artist and art educator from Dallas, Texas. TAMU-C, Wathena Gallery, Annual Juried Student Art Exhibition, and most recently at “Side Effects - Summer 2018 MA/MFA Student Exhibition” at the University Gallery, TAMU-C.